Auto-Compaction settings determine the compaction process; whereby databases and their respective view-indexes are compacted. 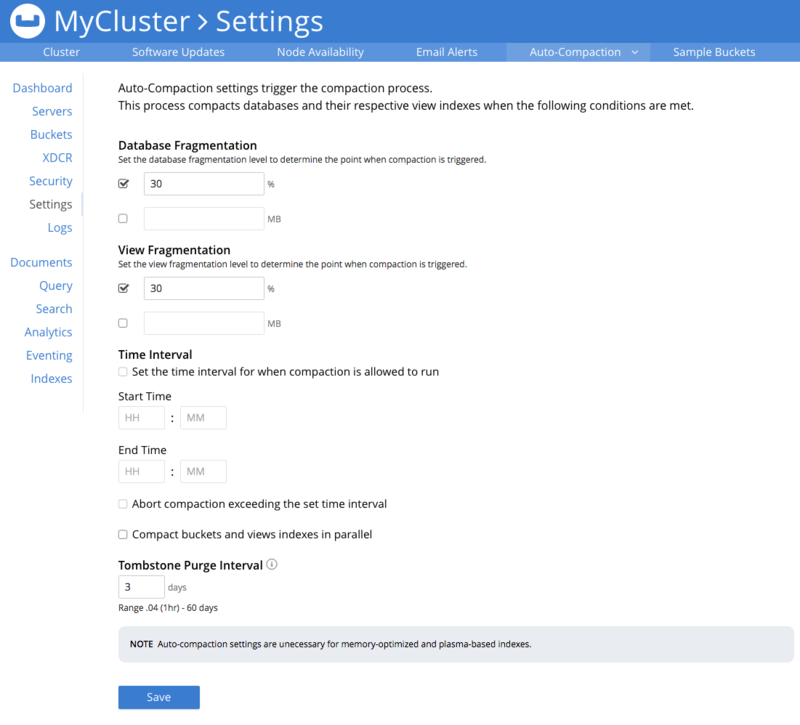 These settings can only be established by Full and Cluster Administrators. 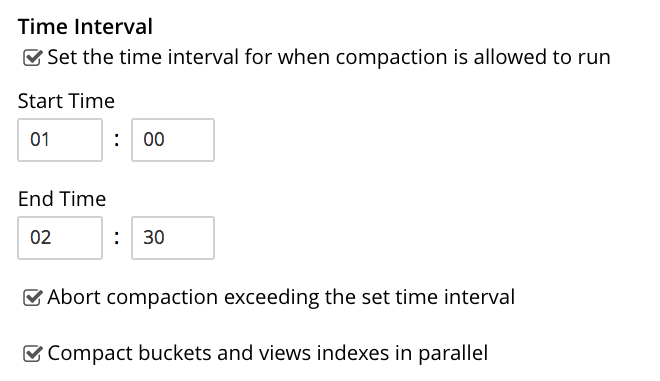 Auto-Compaction is enabled by default for all Couchbase buckets. However, settings can be overridden on a per bucket basis. The dialog expands again, and displays Auto-Compaction settings available for this bucket. This brings up the Edit Bucket Settings dialog: left-click on the Show advanced bucket settings tab. Access the Auto-Compaction panel, and check the Override the default auto-compaction settings? checkbox. The dialog expands, thereby showing the available Auto-Compaction settings. This brings up the Auto-Compaction screen. The Auto-Compaction view of the Settings screen appears as follows. All settings on this screen are also provided on the dialogs whereby you establish custom-settings for an individual new or existing bucket. Settings constitute conditions, which must be met for the compaction-process to be triggered. The settings are described below. Compaction is triggered when database-fragmentation reaches the point specified by means of this interface. You can specify the fragmentation-level as a percentage (the upper field, selected by checking the adjacent checkbox); or as a number of megabytes (the lower). Compaction is triggered when view-fragmentation reaches the point specified by means of this interface. You can specify the fragmentation-level as a percentage (the upper field, selected by checking the adjacent checkbox); or as a number of megabytes (the lower). To set a time-interval during which compaction is permitted to run, check the checkbox at the top of the pane. Then, add a start and an end time into the interactive fields. Note that each left-hand field specifies the hour-of-the-day; while each right-hand specifies the minute-of-the-hour. Checkboxes are provided to allow you to specify: first, that compaction can be aborted if the specified time is exceeded; secondly, that database and view compaction are executed simultaneously (implying a heavier processing and disk I/O load, during the compaction-process). Tombstones are records of expired or deleted items. They include key and metadata. Tombstones are used in Couchbase Server to provide eventual consistency of data between clusters. The auto-compaction process waits for the specified number of days before permanently deleting tombstones for expired or deleted items. The default value is three days. The recommended range of values is 0.04 to 60 (where 0.04 equals one hour, and 1 equals one day. Note that if you set this value too low, you may see inconsistent results in views queries, such as deleted items in a result set. You may also see inconsistent items in clusters with XDCR set up between the clusters. If you set this value too high, it will delay the server from reclaiming disk space. 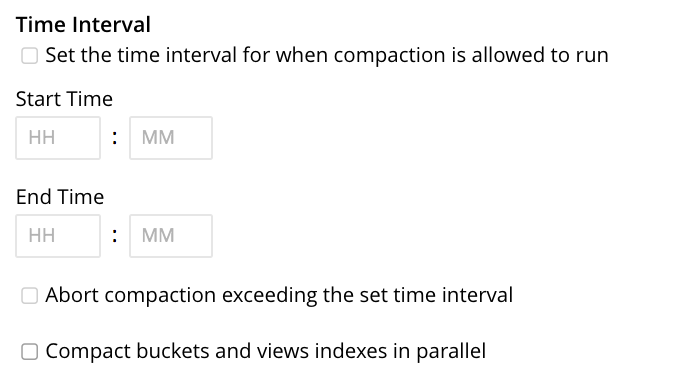 Note that Auto-Compaction settings can also be modified using the Couchbase REST API.